Metakes you as too harsh in the comparison, Dawood! How many medical missionaries or schools, not spreading jihad issue forth into this troubled world from Islam? Muslim Missionaries usually go to Muslim places though as they are most poor. One of the four pillars of Islam is Charity. There is good and bad in both religions. Both have claim to spilling much blood and doing much good. I do believe that this cartoon is about both religions. 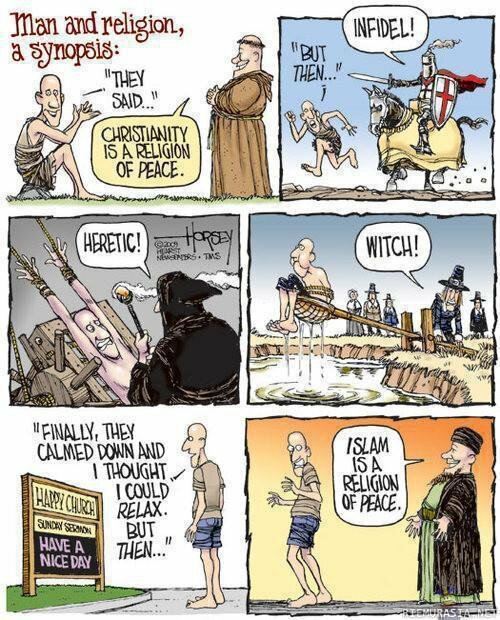 Both Islam and Catholicism/Christianity have been a danger to humanity while proclaiming to be peaceful. Only Islam, though, now stands as a physical danger to this world. Christianity has taken a backseat in the halls of power in the West. Islam is still being used by the powers that be in the Arab world and elsewhere to control people and maintain power over them. Islam is akin to Communism. It is a world devourer ir it attempts to be.